The Golden State Warriors appeared to be on their way to a 2-0 series lead. Not only did they end up losing Game 2 in heartbreaking fashion,135-131, they now have another injury problem and it appears as though it is significant. Just several minutes into their Game 2 matchup against the Los Angeles Clippers, DeMarcus Cousins suffered an apparent quad injury when he dove for a loose ball. On Tuesday, Shams Charania of The Athletic is reporting that Cousins has been diagnosed with a torn left quad. In addition, Charania reports that the Warriors are waiting to see how Cousins responds to rehab in the first two weeks before declaring him out of the season. This isn’t an injury that the team believes will require surgery. Following the loss, Warriors head coach Steve Kerr commented on Cousins’ injury and made it rather clear that he expects their big man to be out for a while. We all know Cousins’ injury history as he was shelved for a full year due to an Achilles’ tear before making his return this past January. 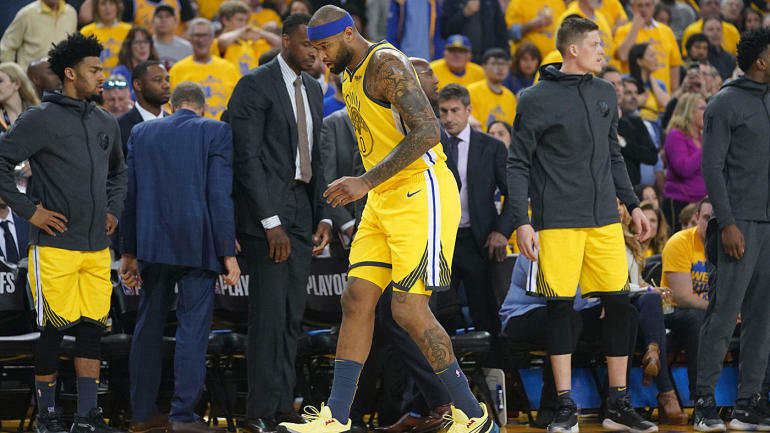 While his new injury isn’t to his Achilles, The Athletic’s Anthony Slater points out why this injury could be concerning for Cousins and the Warriors as it was a non-contact injury, Cousins’ reaction was one of extreme pain and this is the same leg which he injured last season. Cousins struggled mightily in Game 1 — his NBA playoff debut after missing the postseason during the first eight years of his career. The former All-Star center posted just nine points and nine rebounds on 4-of-12 shooting from the field in just 21 minutes of playing time. Kerr had predicted that Cousins would bounce back as the series progressed — something that is now highly unlikely given this latest injury. Once the Warriors provide an official timeline on Cousins’ injury and when he will, potentially, be able to return to the floor we will share that information.